Some Nigerian soldiers, yesterday, fired indiscriminately into the air to protest the killing of no fewer than nine of their colleagues in a deadly ambush by gunmen suspected to be Boko Haram at the border areas of Izhe in Madagali Local Government of Adamawa State. 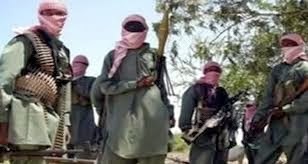 Both local officials and military sources confirmed that the insurgents attacked the soldiers at Madagali, a border town between Borno and Adamawa States. Chairman of the local government, Mr. Maina Ularamu, who confirmed the attack, said the soldiers were on a mission to repel an attack when they were ambushed. It was learnt that the soldiers were left to face the heavily armed insurgents, who attacked them from different directions even with no aerial support to them. It was also gathered that the soldiers protesting the killing of their colleagues complained of alleged tactical errors in the handling of the ill-fated journey. Hospital sources confirmed that the bodies of the dead nine soldiers were deposited at the morgue of the Federal Medical Centre, in Yola.